More info:Price depends on cabin choice Optional Sea Kayaking £624 subject to availability. This ten day Antarctica trip invites travellers to fly over Cape Horn in southern Chile's Tierra del Fuego archipelago prior to bypassing the shudders of Drake Passage before finally coming to rest on King George Island, part of the South Shetlands. Now your Antarctica trip can really start in earnest as you cruise through the icy fjords and creaking icebergs on board an 118 passenger expedition ship, one of the few vessels in the world equipped to deal with remote regions of both the north and south poles. This is an active Antarctic expedition that’s as much about penguins, seals and whales as it is about experiencing life in the wildest and least hospitable continent on the planet, Antarctica. The efficiency that flying over Drake Passage from Punta Arenas brings allows more time to be spent exploring and attempting to cross the Polar Circle on an unforgettable trip of a lifetime. We use small ships on all of our cruises which minimizes the detrimental impacts of our cruises to any part of the world. In the Antarctic it is only permitted for 100 passengers to go ashore at any one time, which controls and minimizes the impact that tourists can have on the land. All of our cruises in this region are accompanied by an Expedition Team that comprises experts in a range of fields such as zoology, polar history, marine biology and glaciology, and usually photography who can educate each guest as to how to behave when out to not harm the environment. 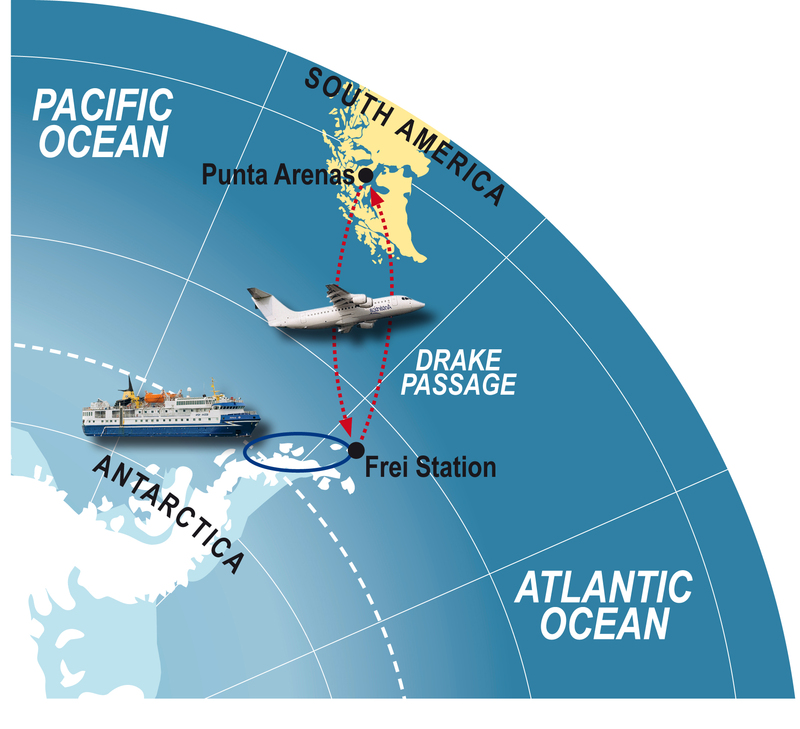 Flying cross the Drake Passage actually reduces total emissions as ships produce more carbon emissions per passenger mile than planes, so by reducing the mileage covered by the ships, this fly cruise is more efficient. All of the ships we work with in Antarctica are managed by companies who are members of IAATO, the International Association of Antarctica Tour Operators. IAATO is a member organization founded in 1991 to advocate and promote the practice of safe and environmentally responsible private-sector travel to the Antarctic. IAATO has resolved to set the highest possible tourism operating standards to protect the Antarctic. This effort is unique, and the challenge to maintain environmentally responsible tourism exists to this extent in no other region of the world. Journeys to Antarctica bear an extra responsibility for the traveler to respect and protect the environment. The Antarctic environment is unique in that man is an intruder on the whole continent, and that binds us with an extra responsibility to make sure we have absolutely no detrimental effect on the environment. The expedition team are responsible for your safety and entertainment, but also your education about all aspects of the Antarctic, and especially its conservation and current conservation issues affecting the Antarctic. They will accompany you on excursions ashore, explaining and pointing out the wildlife, physical features and any historical highlights. -Never taking, harming or interfering with Antarctic wildlife. -Not using aircraft, vessels, small boats, or other means of transport in ways that disturb wildlife, either at sea or on land. -Never feeding, touching, or handling birds or seals, or approaching or photographing them to alter their behaviour. Special care is needed when animals are breeding or moulting. -Not damaging plants, by example by walking, driving, or landing on extensive moss beds or lichen-covered scree slopes. -Keeping noise to a minimum to avoid frightening wildlife. -Not bringing non-native plants or animals into the Antarctic. -Not disposing of litter or garbage on land. -Never disturbing or polluting lakes or streams. Any materials into the sea are disposed of correctly. -Never painting or engraving names or graffiti on rocks or buildings. -Never collecting or taking away biological or geological specimens or man-made artefacts as a souvenir. Stunning Antarctic views, penguin colonies, whales ... Kayaking, swimming in Antarctic Ocean! because of adverse weather conditions. There is no refund even if the trip is cancelled.